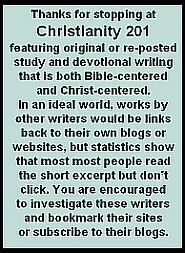 Christian author and television personality Sheila Walsh writes a weekly devotional at SheilaWalsh.com. Here’s a sample of what subscribers are getting…just click the title below to read at source and sign up. That was until Christian was tackled, legitimately, from behind and as he lay face down on the field another boy from the opposing team intentionally stomped on the back of his left knee. It took both hands on the tail of my jacket for my husband to keep me in my seat! His injury led to knee surgery and after one more bad fall, a second surgery. At that point the surgeon told him his football days were over. Christian was disappointed but he rebounded and threw himself into many other interests. Some disappointments are not like that though. Some are devastating and life altering. I think of the mom who challenged me after I’d spoken in her city. “You said something on stage tonight that can’t be true,” she said. “You said that God is all powerful and that God is all loving.” She replied. I held her as tears ran down her face in rivers. That’s one of the greatest challenges to our faith. Will we still love and worship a God we don’t always understand? Will we still love Him when our marriage is not healed? Will we still worship when we didn’t get that job we so badly needed? In moments of profound disappointment and pain the enemy loves to make us question God’s love for us. Her husband came back but yours didn’t! God doesn’t love you as much as he loves her! Why bother praying, no one is listening! 1 — The enemy is a thief and a liar. 2 — God is for you. He promised to never leave or forsake you. He held nothing back in saving you, not even the life of His own son. The hope that Paul speaks about in his letter to the Church in Rome is different than anything this world has to offer. This hope is not wishful thinking. On the contrary, it’s the stuff you can stake your life on! Until we see Jesus face to face we will endure storms. Some will blow over quickly while others will seem to last longer than we can bear. It used to be that if I were walking through a hard season I would be confident that God would get me through, and when He did, I would worship and thank Him. But what I’m learning in this season of my life is to worship Him in the middle of the storm, before there’s even a hint of dawn breaking, because He is worth it! I want to encourage you today. If you are facing some rough seas — lift up your head, your heart, and your hands to the Lord and worship your way through the storm. He will hold you as you do. REMEMBER: God is for you and He loves you. 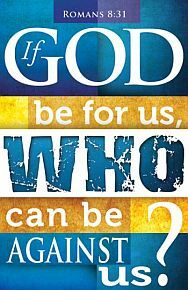 NIV I John 4:7 Dear friends, let us love one another, for love comes from God. Everyone who loves has been born of God and knows God. 8 Whoever does not love does not know God, because God is love. 9 This is how God showed his love among us: He sent his one and only Son into the world that we might live through him. 10 This is love: not that we loved God, but that he loved us and sent his Son as an atoning sacrifice for our sins. 11 Dear friends, since God so loved us, we also ought to love one another. 12No one has ever seen God; but if we love one another, God lives in us and his love is made complete in us. 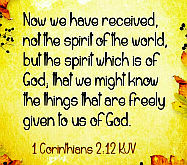 13 This is how we know that we live in him and he in us: He has given us of his Spirit. 14 And we have seen and testify that the Father has sent his Son to be the Savior of the world. 15 If anyone acknowledges that Jesus is the Son of God, God lives in them and they in God. 16 And so we know and rely on the love God has for us. God is love. Whoever lives in love lives in God, and God in them. 17 This is how love is made complete among us so that we will have confidence on the day of judgment: In this world we are like Jesus. 18 There is no fear in love. But perfect love drives out fear, because fear has to do with punishment. The one who fears is not made perfect in love. The message that “God is Love” is one of the first thing children learn in Sunday School, or whatever you term its modern equivalent. “Jesus loves me, this I know…” It seems so basic, so obvious that chances are many of you read the above passage so rapidly that any new truths that could be revealed from the passage didn’t have the split-seconds necessary to take root. 13-16This is how we know we’re living steadily and deeply in him, and he in us: He’s given us life from his life, from his very own Spirit. Also, we’ve seen for ourselves and continue to state openly that the Father sent his Son as Savior of the world. Everyone who confesses that Jesus is God’s Son participates continuously in an intimate relationship with God. We know it so well, we’ve embraced it heart and soul, this love that comes from God. 17-18God is love. When we take up permanent residence in a life of love, we live in God and God lives in us. This way, love has the run of the house, becomes at home and mature in us, so that we’re free of worry on Judgment Day—our standing in the world is identical with Christ’s. There is no room in love for fear. Well-formed love banishes fear. 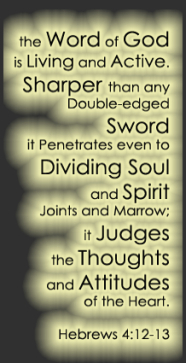 Since fear is crippling, a fearful life—fear of death, fear of judgment—is one not yet fully formed in love. 19We, though, are going to love—love and be loved. First we were loved, now we love. He loved us first. 20-21If anyone boasts, “I love God,” and goes right on hating his brother or sister, thinking nothing of it, he is a liar. If he won’t love the person he can see, how can he love the God he can’t see? The command we have from Christ is blunt: Loving God includes loving people. You’ve got to love both. Think about it… trained missionaries with a respected Christian organization need to be reminded that they are loved by God. They can’t reach out to others with God love until they feel the embrace of that perfect love for themselves. They need to be immersed in the awareness of God’s love for them before they can share it with others. Where does that leave you and I? My guess is that many efforts at evangelism are thwarted because the “sent ones” lack the 100% conviction that God truly loves them, and I include myself as often guilty of this as well. Some will say that today’s item wasn’t exactly Christianity 201, but more like 101. I wonder if the truth of knowing the love of our Heavenly Father is really more like Christianity 301 or 401? Just a reminder, here at C201, scripture passages are usually in green to remind us that God’s word is life.